Michigan is well-known for its produce. Starting with asparagus and strawberries in the earliest part of the growing season and going all the way through pumpkins and apples in the latest, good things to eat are always showing up. When it comes to sampling the local produce, a farmers market does a great job of delivering a lot of options in one place. So, for those who want to try Michigan produce so close to the peak of freshness it was often harvested bare hours prior, a farmers market is the way to go, and we're taking a look at 9 of the greatest the state knows. While a farmers market is best-known for its surfeit of options, Flint has a staggering amount by even farmers market standards. Run year-round, the Flint Farmers Market features not only offers in-season fruits and vegetables, but also bread, cheese, wine, poultry and other meats. It also boasts its own art gallery, cafe, and gift shop, which means there's very little that can't be found within its operations. Birmingham's farmers market has an advantage thanks in part to its location. Run from May to October, the Birmingham Farmers Market offers seasonal produce, as well as specifically organic produce. A set of prepared goods are also on hand, and when the shopping is over, take advantage of the location. It's set up just right nearby the Salvatore Scallopini Restaurant, so a complete dinner can be enjoyed immediately after a long day of walking the booths. The Upper Peninsula often gets short shrift in tourism trade, except for those interested in natural beauty. All that nature, however, means great opportunities for farming, and that makes Marquette's Marquette Farmers and Artist's Market a major means to access the results of that farming. Throw in a set of displays contributed by local artists, which by itself is something of an impressive development, and the result is produce with a noteworthy side of art. 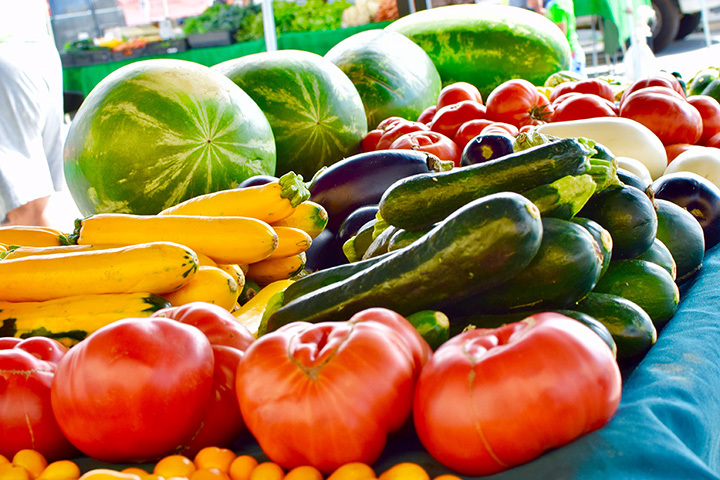 Better yet, the market is involved in the Project Fresh program staged by the Women, Infants and Children (WIC) program, which helps get fresh fruit and vegetables to the low-income consumer. Eastern Market, in Detroit, is sometimes regarded as the largest such market in the state, and with good reason. Run year-round on Saturdays, and Sundays and Tuesdays as well between June and October, there's a lot to check out here in this market, which measures over six blocks square. Produce, of course, is king, but a meat market and local crafts are also on hand, with over 250 vendors on hand during the height of the season. Michigan's capital, Lansing, isn't just about politicians' hot air. It's also about one impressive farmers market in the Lansing City Market. Operating year-round, there's not only the basic standards of seasonal produce, but there's also local cheese, local meat, assorted healthcare items, and even some gluten-free material on hand. Just to top it off, a hot meal isn't far away as a complete bar and grill operation is in the building, along with several prepared-food sellers. Set it all up in a building that looks like a huge barn, and it makes for one impressive farmers market. There are a lot of reasons to go to Holland, and while out there, stop in on the Holland Farmers Market, which will go light years beyond the standard produce display. Since Holland is itself known for tulips, it likely won't surprise many that the Holland Farmers Market is known for floral arrangements. Add plants of all types, a variety of baked goods, a food court for breakfast and lunch, and even some street performers of various types and the package is about as complete as it gets. The eponymous Ann Arbor Farmers Market brings with it a host of options, making it a powerhouse in the field. It starts with different seasonal produce, but goes on to shrubs, flowers, maple syrup, baked goods and beyond. In fact, the "beyond" is where things really get interesting: that "beyond" includes things like homemade clothes, furniture, and even toys. The market is open year round; May - December they are open Wednesday and Saturday from 7:00am -3:00pm. January - April they are open only on Saturdays. Grand Rapids brings out one of the few farmers markets that isn't named after itself first off. The Downtown Market, sometimes called the Grand Rapids Downtown Market for emphasis, offers up all the standards, but also brings in some lesser-seen goods like meat and cheese. Hot coffee can be had throughout, and there are even, in perhaps the greatest twist of the list, taco vendors, at last report. The Downtown Market even offers classes for shoppers to learn just about anything, including how to make specialized Halloween party cocktails. Finally, we head up north to the Leelanau area to check out Suttons Bay's 9 Bean Rows farmers market. A combination farmstead, market and bakery, 9 Bean Rows offers the standards of local produce and baked goods, with some products reportedly offered year-round. In perhaps the highest point, however, 9 Bean Rows is a “no-spray farmstead,” which means that there's not much in the way of chemical agents involved in the production of said material. View more Michigan Farmers Markets.